When I’m an idiot, don’t blame God. There is a sort of religious corollary to Godwin’s Law. 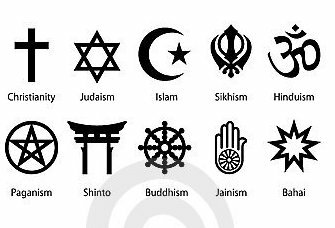 I am not sure exactly how to formulate it, but it seems that the longer any online discussion of public issues continues, the greater the likelihood that someone will eventually make a reference to religion as the source of injustice, oppression, prejudice and other social evils. The conversation then turns from whatever the topic was to a very polarized debate about religion, or it fizzles out altogether. It is no secret to the handful of regular readers of this blog that I am a Catholic Christian who leads what some might call a very pious life. Those of you who know me in other settings know that I am not a cookie cutter believer and that I am not shy about saying what I think, even when (or particularly when) my opinions differ from the perceived (or even explicit) position of my faith family. God created human beings with free will. We were created with the innate ability to believe or not, to choose to act for good or for evil, even to decide for ourselves what to believe in (or not) and to define good and evil in any way we wish. One of my most basic religious beliefs is that God is God and I am not. If God saw fit to leave this huge responsibility of choice in the hands of human beings, who am I to take it away? It is not up to me to use civil law to take choice away from human beings who disagree with me. I am free to tell people what I believe and explain why I think there are better choices to be made. I am not free to threaten them with fines or imprisonment or physical injury or humiliation to make sure their choices are the ones I prefer. I am probably very heavily influenced by what I was taught is the principle of separation of Church and State in the USA. That principle of separation seems to be under a great deal of strain at the moment, and I certainly find it hard to see its application in some of the recent state legislation I’ve read about. But again, I am guided by the axiom God is God and I am not. If God left us free will, who am to take it away? But… If I do act as though I’m God and start filling in the spaces that God left to each individual to fill, it is not God’s fault. It is mine. Don’t blame God because I am an idiot. And please don’t blame me because some members of my religion are idiots. Let’s keep the personal responsibility that accompanies free will squarely on the individual, where it belongs. Among the readers of Telling Knots are believers in at least three different religions, atheists, agnostics, and people for whom religion has no real place in their life at all. Most readers don’t comment, but I am really interested in hearing your thoughts and feelings about this post. Please take a couple of minutes to share your reactions. This entry was posted in Current events, Justice, Living intentionally, Spirituality and tagged church and state, free will, Godwin's law, public debate, religion by Knot Telling. Bookmark the permalink. I love this “God is God and I am not” 🙂 and also the part about not blaming a whole faith/religion because of the misdeeds or idiocy of some of its members. Your article here reminded me of my thoughts when I first heard about people blaming God for the atrocities of wars, saying that if He wanted he would’ve stopped them and that not having stopped massacres, wars or wathever bothers the people means -to them- that He’s either non-existent or not fait. Why would we blame Him for people’s wrongdoing. He gave us all free will accompanied by a reward-punishment system: do good and you’ll get rewarded (if not in this life, then in the After life), do bad and you’ll be punished (again here or there, or maybe both). If personally find it of utmost justice and nothing can be more fair than this. What I can’t understand is why people think that they have the right to sit on their derrière while atrocities are being commited, and expect God to do for them their job of doing good, defending good, and fighting evil! Now THAT is unfair, and stupid. I totally agree – with both you and Cherine – I will not re-invent the wheel here – enough said, and very eloquently too, by both of you :-). You reminded me of a poetry verse by a Syrian poet, Nazar Qabbani, blaming Arabs for expecting God to defend them when they do nothing (if I remember correctly, that poem was written after the 67 war), he said: “God is not an ironsmith who makes swords”. Meaning don’t just ask Him to defend you and win wars for you when you yourselves are only weeping and praying and asking for victory without working. Also, again in Islam, there’s a Hadith (saying) of the prophet telling the story of a man who asked the prophet: should I tie my camel or depend on God (that the camel won’t get lost/wander away)? The prophet answered him: tie it and depend on God. This resonates with me. I am a Christian too, and regularly feel bashed for my faith. It hurts. I’m not even in America, but I feel like I keep getting dragged into very particularly American arguments, and that people assume they know everything about me and my faith because they’ve seen the way some people behave on the American stage while calling themselves Christians, and that the behaviour of those people, six thousand miles away and a world away from my feelings and beliefs, makes others justified in being dismissive, hostile or just plain rude to me. This has happened IRL, not just on the Web. I come from a tradition of Scottish Protestant thinking which greatly values science and logic, and I just can’t get with this whole “Christianity vs. Evolution” argument. It feels so irrelevant to me, and yet on that score I feel attacked from both sides. Again, something is seeping over from what is really a very American argument and infecting relationships within and outside the church in other countries as well. I find myself in conversations in church groups where everybody is sort of assuming that young-earth Creationism is the only acceptable view, and having to stop and gather my courage before dissenting. Because it’s not just about a differing opinion in an esoteric debate, it’s now set against the backdrop of all the lunacy and hostility which, really, originates in the politics of the USA, not in anything to do with God or science at all. Sorry, this was very long. But I’m sure there are many, many people out there who are Christians and believe very strongly in things like the separation of Church and State, the importance of science, freedom of choice in sexuality, and so on, but who are afraid to speak out for fear of being attacked, on one side because of their “dissenting” views (which aren’t so unusual, really, just not often heard) and on the other side simply for being a Christian. I’ll tell you what it feels like. I live in the West of Scotland, a beautiful place where sectarianism is never far away. Saying you’re a Christian right now feels like standing in a pub in the East End of Glasgow and shouting, “I’m a Catholic!” or “I’m a Protestant!” – you may feel like you’re just stating your identity or beliefs, but in actual fact you’re taking sides in a huge, dangerous argument with implications you can’t begin to appreciate, and lunatics on both sides waving golf clubs and baseball bats and just waiting for a chance to beat someone – anyone – to a pulp, because that’s what they really wanted all along, and everything else was just an excuse. So you keep quiet. And all the time the brawl goes on around you, but really, what can one person do? I am intermittently Agnostic, devoutly Pentecostal, and at times just spiritually inept. I have no problem knowing that it’s best to let others wrangle with their own issues. I don’t even know whats best for myself, but you have a strong faith and can still see that. You have, as always my utmost respect. That kind of wisdom is why your blog is on the top of my read list.